Movies have been used for years as a way to reach people with the gospel. However, in some countries, unapproved religious content isn’t permitted. Allegories like The Pilgrim’s Progress can subvert the censors in countries where preaching the Gospel is prohibited and give missionaries tools to share the love of Christ with people who desperately need it. The Pilgrim’s Progress has been translated into over 200 languages, has never been out of print and has sold over 200 million copies – more copies than any Christian book, next to the Bible. Written in 1678 by John Bunyan while in prison for holding religious services, The Pilgrim’s Progress is often cited as the greatest allegory ever written. The 2019 film will be the story’s feature-length theatrical debut, as well as the first computer-animated telling of the timeless tale. Media-driven families can be assured that this centuries-old story can still connect with viewers of all ages. Theatrical release for 2 days only! April 18 & 20, 2019 Easter weekend! 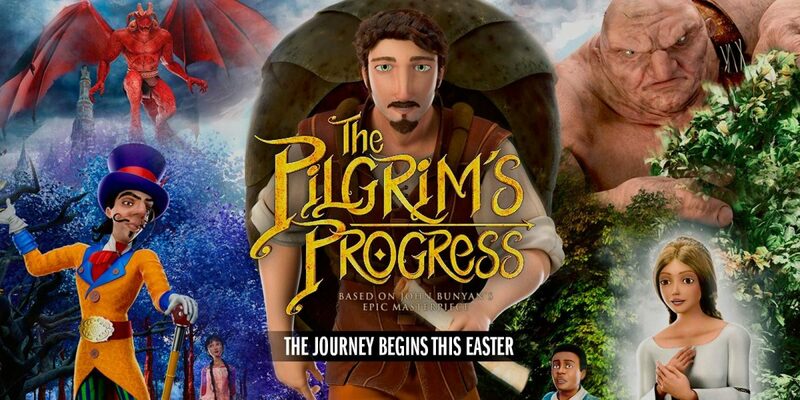 You can buy tickets now at pilgrims.movie to see The Pilgrim’s Progress on Thursday, April 18th at 7 p.m. or Saturday, April 20th at 12:55 p.m. I sat down with my family to watch this film not knowing what to expect. Of course, I knew John Rhys-Davies’ performance would be top-notch but I was unfamiliar with the other actors. Additionally, I didn’t really like the animation style. I think I’ve become so used to seeing what Pixar and Disney produce, any other style looks dated or less appealing. I decided to put aside my issues with the animation and focus more on the plot, pace, and performances. The story, of course, is timeless. Revelation Media’s adaptation is approachable and retains much of the original style while still making it appealing to modern audiences. Our church had used a Sunday School curriculum based on the novel so my kids were familiar with the story. At times they pointed out when things differed from the original and I reminded them that this is not intended to be an exact copy of the novel. The pace of the film was just right. One trend in modern filmmaking is to make these epic tales and that often means adding or extending scenes to make the running time longer. I never felt like that happened. The 105 minutes of runtime feels just right and at no point was I looking at my clock wondering when this film would end. As I expected, John Rhys-Davies shined in every scene as Evangelist. I’ve seen him in other small-budget, faith-based films and he never just phones it in. Ben Price’s performance as Christian was good as well. I was unfamiliar with him as an actor and thought he did a great job portraying the story’s lead character. Most of the other performances were ok, there’s nothing that really stands out to me. I think it’s important to keep the purpose of making this film in mind when reviewing it. It’s intended to be an outreach tool for missionaries. The message and method are more important than the medium. The intended audience isn’t American Christians, it’s non-believers in other countries. One of the executive producers of the film, Steve Cleary, worked for The Voice of the Martyrs so he’s familiar with what it takes to reach people in difficult situations. I have an interview scheduled with Steve and I’m looking forward to talking to him about the process of creating The Pilgrim’s Progress. I think Steve and everyone else involved succeeded in creating a film that will reach millions with the Gospel and help lead people into a saving knowledge of Jesus. Making a Christian film is hard. I’d encourage you to support this film in theaters because its purpose is to spread the Gospel. As part of the promotion for this film, I am giving away 3 illustrated story books and 3 $25 Fandango e-gift cards, redeemable for The Pilgrim’s Progress. Only U.S. residents are eligible for this giveaway. Each winner will receive a storybook and a gift card. Disclosure: I received a free pair of tickets and an illustrated storybook in exchange for this review and promotion of the film. I’d love to take my kids to see it. What a deep voice in my ear. I’d love to see this movie!